Since Li-Fraumeni Syndrome cancers can pop up just about anywhere in the body and at any age, screening can be a bit of a challenge. There are studies currently being done to see if whole body MRI is reasonable. Preliminary studies show that people with LFS do tend to grow lots of lumps and bumps and not all of them are cancer. Part of the research conundrum with MRI screening is finding what to follow up on and what to wait and watch. We do know that catching cancer early leads to more effective treatment and potentially cure. Many times it is the best practice to find the balance between early detection and false positives. False positives can create a lot of stress and extra time and cost to follow up. Since we are sensitive to radiation, Magnetic Resonance Imaging can be used when possible for screening those with LFS. If you are curious about how MRI works, check out our previous blog MRI 101. There are benefits to using CT or PET/CT for diagnosis and it is always a good idea to talk to your doctor if you are concerned about radiation exposure. To learn more about the differences between MRI and PET, you can read the blog post HERE. All of that theory aside, sometimes kids have to have scans, whether it is for injury or routine screening, the process can be frightening for a young child. I am an adult and still get scanxiety. If full body MRIs are going to be a part of your child’s routine, it is helpful to have positive experiences to start with. Many hospitals have Child Life Specialists who are trained to help your child have a better experience and ease some of their fears. If you have a child who seems to be nervous about the experience, do not hesitate to ask if your hospital has a Child Life Specialist. There are even hospitals that have mock MRI suites. For many of us in remote locations, our hospitals don’t always have these resources, but there are some things we can do to help prepare our kids for MRIs. Always be honest with your child while giving them age appropriate information. A 3 year old can’t possibly understand screening for cancer, but they do know that they have to go to the doctor for physicals and get their teeth cleaned a couple times a year. Having an MRI for screening is like that. There is a special machine that can see inside parts of us that the doctor can’t see. As kids get older, I let their questions guide our conversations. I talked to a couple Genetic Counselors at the 2016 REACH LFS Conference who are working on resources for this, how to talk to your child about LFS and screening. Until those resources are available, I will share with you some of the tips and resources I’ve heard about through our child life specialist and our support group to help kids with MRIs. 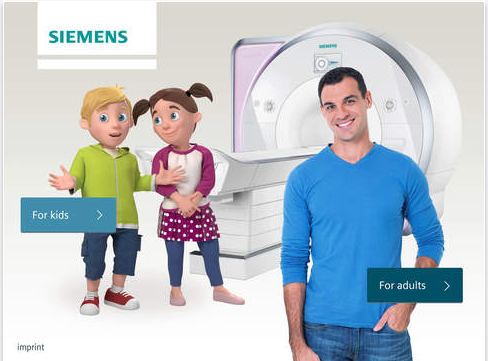 Here is a useful link to information from the University of Chicago Children’s Hospital on preparing a child for MRI and when to prepare them based on their age. This is a great introductory video for kids about MRI from our friends at Nationwide Children’s Hospital. Many young children are sedated for MRI’s because they cannot hold still enough to get good images. With some practice at home and preparation, many kids can get through MRIs without sedation. It is always best to talk with the doctors at your hospital or facility about what they recommend for your child. Some MRI machines have headphones to listen to music, others even have goggles to watch DVDs on. The full body MRI series for LFS can take a couple of hours, which my kids usually count as one movie and part of another. Some people like to get the entire MRI over with in one session, others have it split up into multiple visits. If your facility does not have music or goggles, it is good to talk to your kids about techniques to use while in the MRI. Some kids pretend they are in a spaceship blasting off and think about all the planets they will visit and the aliens they will meet, others think of it as being on a ride at Disneyland and imagine walking around the parks. Some think about their favorite books or building legos. My girls used to practice by laying under the desk and making loud noises at each other. Getting an MRI does not hurt. There are times when contrast is used to help the doctors see better inside the body. Remember those blue pills you used to chew at the dentist to see how well you brushed? The contrast helps the MRI take better pictures and the best way to get it inside our body is through an IV. This is my kids’ least favorite part, the injection for contrast. Usually if contrast is ordered, the technicians will place an IV in before the MRI even begins. There are numbing creams that can lessen the pain, but often this is the scariest and worst part for kids. 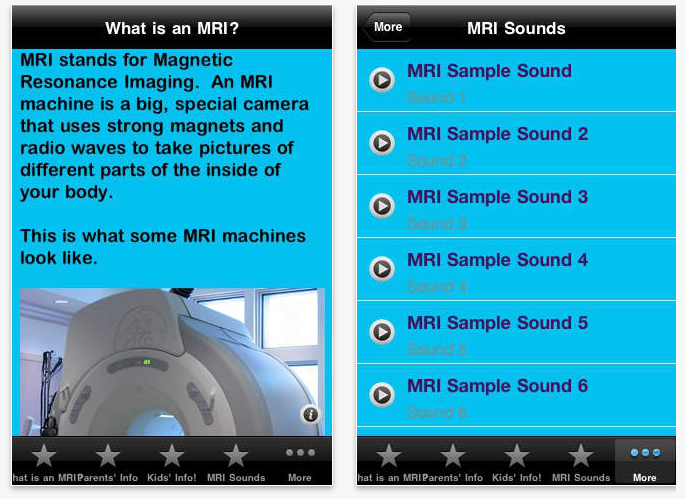 There are several apps available online that replicate MRI sounds and talk about the whole MRI process. There are also many videos with sounds on YouTube. Here are a couple of ones we’ve used. This app is free on iTunes and has a lot of fun features. One down side is it only available for iPad. There is a google play version. The app has a checklist, what to wear, cartoon friends that answer common questions and help kids prepare. It shows how the machine works and the noises the MRI makes. It even has a 360 degree view so you can see what it looks like from inside the MRI. This would be great for a practice run through at home. There are example MRI images that my daughter was excited about and that she could pick objects to place in the MRI and see what they looked like. This app is $1.99 and very basic. It has simple graphics and easy to understand information about an MRI. It has 6 different variations of the sounds that MRI machines make. This was the app our Child Life Specialist uses, so I know she uses it over and over. It is available on iPhone and iPads. Living with LFS presents a lot of unique situations for adults and kids. We hope that some of these resources help having an MRI a little bit easier so you and your kids can get back to living. Dr. Emilia Modolo Pinto Answers Questions About Cancer Predisposition Genes and Childhood Cancer in LFS and Beyond. Research articles often are difficult for the average person to understand. One of our goals at living LFS is to help make this information easier to understand so everyone can benefit from the exciting advances in science and medicine. In November, The New England Journal of Medicine published an article about childhood cancer, hereditary cancer genes and predisposition to cancer. Dr. Emilia Modolo Pinto graciously agreed to answer a few questions to help us better understand the article and what it means for not only the LFS community, but for the public in general. Emilia Modolo Pinto, Ph.D., is a researcher at St. Jude Children’s Research Hospital. She studies adrenal tumors in children, which are often associated with Li-Fraumeni Syndrome and TP53 mutations. In this interview, she talks about her work studying Li-Fraumeni syndrome. Dr. Pinto, please tell us a little about yourself and how you became interested in hereditary cancers. EMP: I finished my Ph.D. in Brazil in 2005. Since then, I have been studying tumors of the adrenal gland in children – adrenocortical tumors. Specifically, I study the molecular biology of these tumors – how they happen at the most basic level, the cell. Pediatric adrenocortical tumor is a rare disease, but there are many cases in southeast Brazil. In this area, it is strongly associated with a mutation in a gene called TP53. For families who are interested, the mutation is called R337H. When I was doing research for my Ph.D., I had the opportunity to study several families who have this mutation. For some families, I was able to study 3 or more generations. I learned that the mutation in the TP53 gene was passed down, without change, in every generation I studied. I also found that this mutant gene was the same in other families. The Brazilian families who have this TP53 mutation all have a history of many different cancers. Some families have a child with adrenocortical tumor, and other families have different tumors in all generations and in all ages. The situation in Brazil caught my attention and gave me an interest in hereditary cancer. Recently, the New England Journal of Medicine published an article about germline mutations in predisposition genes in pediatric cancer. Can you tell us what germline mutations in predisposition genes are, and briefly summarize what this article was about? EMP: Yes. The cells in eggs and sperm are called “germ cells.” What scientists call “germline mutations” are mutations in these specific cells. When a germ cell with a mutation joins with another germ cell to form an embryo, every cell in the embryo will carry the mutation. Now, some of these mutations affect genes called “predisposition genes.” If these genes have a mutation, they make a person more likely to develop cancer. So if a germ cell mutation affects 1 (one) of these predisposition genes, it can increase the chance of developing 1 (one) or more cancers. It’s important to stress that everyone responds differently to gene mutations. Even if everyone in a family has the same mutation, affecting the same predisposition gene, some family members will get cancer and some will not. In the New England Journal of Medicine article, the authors studied 1,120 children with cancer. They carefully examined the germline sequence of 565 genes reported be associated with cancer, and paid close attention to 60 predisposition genes that are known to increase cancer risk if 1 (one) copy of the gene is changed. Remember, a child gets 1 (one) copy of each gene from the mother and 1 (one) from the father. So, these particular predisposition genes are known to increase cancer risk if just 1 parent has a mutation. In this study, almost 9 percent of patients had germline mutations in 21 of those 60 genes that scientists paid close attention to. People with Li-Fraumeni syndrome, or LFS, have mutations in their germline TP53 gene. In this article, researchers studied those mutations and several others. The results of the mutations and cancer types in the study seemed to be somewhat unexpected. What were the main things researchers learned from this study? EMP: Researchers studied several predisposition genes, not just TP53. They chose which genes to study by reviewing the medical literature, what is already known. They also reviewed genetic databases. Usually, patients who have a lot of cancer in their families, or what we call a strong family history, have genetic testing. They get tested for a mutation in a cancer predisposition gene. But in this study, the researchers found that more than half of children with germline mutations in predisposition genes did not have a lot of cancer in the family – or any at all. They had what we call a negative family history of cancer, meaning cancer did not seem to run in the family. The results of this study will help researchers find more people with mutations in certain families. These people can benefit from genetic counseling, examinations, and tests to check for cancer. The study results will also affect how doctors take care of people with Li-Fraumeni syndrome. They will be able to find and keep track of these patients and families better. Some mutations were “deemed to be pathogenic or probably pathogenic.” What does this mean? EMP: There has been a lot of progress in genetics since the early 2000s, and scientists have found many mutations. Some of them are what scientists call “pathogenic” mutations. This means they lead to disease, such as cancer. Scientists have studied these mutations in animals, and they know having the mutation keeps cells from developing normally. Other mutations are what we call “probably pathogenic.” We can find a mutation that probably keeps cells from developing normally. But studies in animals have not yet shown that the mutation definitely causes disease. In other words, we do not know enough about those mutations yet. Even though the “probably pathogenic” mutations are associated with cancer, we need to learn more about how they cause it. Why do you think the study group included more patients with leukemia and adrenocortical tumors than expected? EMP: This study was part of the St. Jude -Washington University Pediatric Cancer Genome Project. The cancers studied in that project are difficult to treat. Or scientists don’t yet understand how these cancers develop. Adrenocortical tumors and the types of leukemia in this study fall into these categories. For people who are interested in comparing studies, this study was able to analyze more cases of leukemia and adrenocortical tumors, compared the Surveillance, Epidemiology, and End Results (SEER) program. The article says, “Discovery of 4 germline mutations in the TP53 and RB indicates that a fraction of the mutations in this study were de novo.” What are de novo mutations? Does this mean that some children in this study had a hereditary mutation, but did not actually inherit it from their parents? EMP: “De novo” mutations are mutations that are found for the first time in 1 (one) family member, but not in either of their parents. A de novo mutation can come from a mutation in an egg or sperm cell from 1 (one) parent. Or it can come from the fertilized egg itself. To learn if a mutation is inherited or “de novo” the parents of a child with the mutation should be tested, to see if they also have it. However, it’s important to know another reason that we sometimes cannot find a mutation in the parents. A condition called ”mosaicism” ,means they have the mutation in some of their cells, but not all of them. This can make a mutation difficult to find with common genetic tests. I have Li-Fraumeni Syndrome and so do my children. What do the results of this study mean for us? EMP: Mutations in the TP53 gene are probably the most common cause of cancer in children. So there are probably many more children with LFS than we know about right now. Children and adults with germline TP53 mutations need regular examinations and tests to screen for cancer. This can help find tumors as early as possible, when they are most likely to be cured. What does this study mean for the public? EMP: Scientists are learning more about what having a germline predisposition mutation means for childhood cancer. Knowing this type of mutation is present will help doctors care for patients more effectively. It will also help doctors care for family members of people with mutations. We know more about the risk of cancer, and knowing the mutation is there helps us decide on care and treatment for patients with mutations. Also, regular examinations and tests for patients with mutations will improve cancer care, because doctors can find and treat tumors earlier. Perhaps in the future, it will even be possible to prevent tumors from forming. There are some very valuable take away points from this article. Children shouldn’t get cancer and when they do, researchers are now finding that family history isn’t always the only indication of a possible germline mutation. To serve the pediatric population better, to find better treatment and screening, genomics and genetics will play an even more important role as we go forward. The hope is that some day we will be able to prevent these mutations and the cancers they cause. We’d like to thank Dr. Pinto for sharing her time and knowledge with us. The study referenced in this interview is from the St. Jude Children’s Research Hospital — Washington University Pediatric Cancer Genome Project and appeared in the November 18 edition of the New England Journal of Medicine.